Nikola Jokic recorded a triple-double and hit a clutch shot with 2.4 seconds remaining to lead the Denver Nuggets to victory over the Miami Heat. 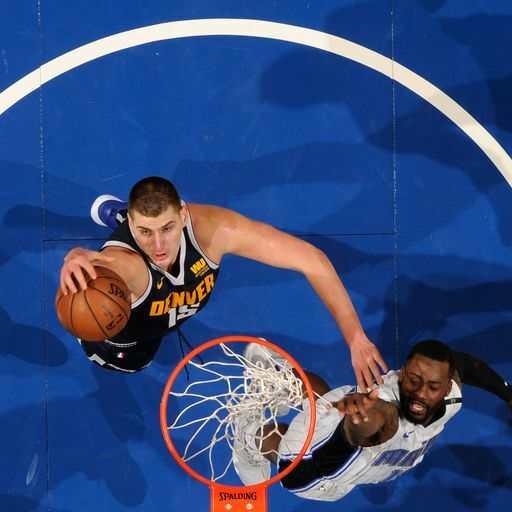 Nikola Jokic's fourth triple-double of the season - 29 points, 11 rebounds and 10 assists - carried the Western Conference-leading Denver Nuggets to a 103-99 win over the host Miami Heat on Tuesday night. Jokic hit the go-ahead shot from the lane with 2.4 seconds left over the arms of back-up center Bam Adebayo, who played great defense on the play. But Jokic awkwardly floated his shot over Adebayo and hit nothing but net. Miami still had a chance to tie or go ahead, but Kelly Olynyk's in-bounds pass was wild, leading to a turnover - just the Heat's sixth in the game. Jamal Murray, who scored 18 points for Denver, then made two free throws with 0.9 seconds left to seal the victory. Torrey Craig also had a big game for Denver. The unheralded 6ft 7in forward had 11 points and a game-high 16 rebounds, also his career high. Miami reserve guard Dion Waiters had a team-high 15 points, and Heat center Hassan Whiteside had 12 points and 11 rebounds. Adebayo had 11 of his 13 points in the fourth quarter, but he couldn't stop Jokic on the game's key play. 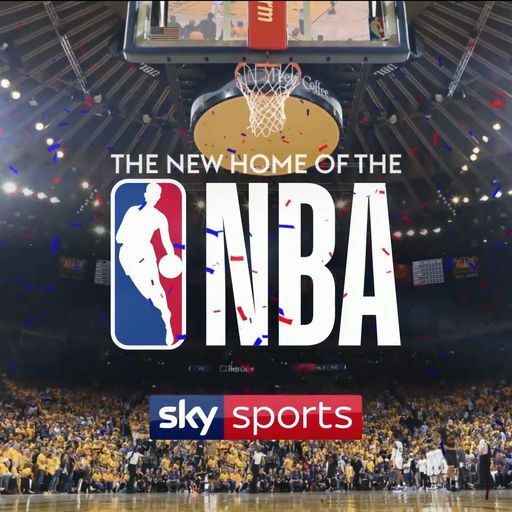 Klay Thompson connected on seven three-pointers in a 43-point performance, helping the Golden State Warriors send the New York Knicks home after a 122-95 shellacking in Oakland. Kevin Durant had 24 points and Stephen Curry complemented 14 points with a season-high 14 assists, enabling the Warriors to snap a three-game home losing streak. Mario Hezonja scored a team-high 19 points for the Knicks, who completed a 14-day, six-game trip with a fifth loss, their second in two nights. Thompson hit 18 of his 29 shots en route to his second 40-point game of the season (and the 12th of his career). The Warriors completed the first half of their season 27-14, six games behind last year's pace that produced the second-best regular-season record in the Western Conference. Enes Kanter had a double-double for the Knicks with 12 points and a game-high 16 rebounds. Tim Hardaway Jr (13 points), Kevin Knox (12), Allonzo Trier (11) and Trey Burke (10) also scored in double figures for the Knicks, who reached their midpoint of their season at 10-31. Andrew Wiggins scored a season-high 40 points as the visiting Minnesota Timberwolves beat the Oklahoma City Thunder 119-117. It was Minnesota's first game under interim coach Ryan Saunders, who replaced Tom Thibodeau on the bench. Thibodeau was fired Sunday after the Timberwolves' home win over the Lakers. A Minnesota turnover with 15.5 seconds left gave the Thunder one last chance, but two Russell Westbrook three-point attempts missed the mark and Paul George's desperation putback went wide to give the Timberwolves their third consecutive win. The Timberwolves hit 32 of their 40 free throws, with Oklahoma City making just 19 of 26. Wiggins was 16 of 18 from the free throw line. Minnesota had 15 offensive rebounds. The game was delayed for more than five minutes with 5:16 remaining in the third quarter after Oklahoma City's Nerlens Noel went up for an attempted block against Wiggins. As Wiggins elevated, his elbow caught Noel flush to the face, dazing him. As Noel fell, he couldn't brace himself and hit his head on the floor. Noel, who appeared to be knocked out by the contact, was eventually taken off on a stretcher. A minute later, Minnesota's Jeff Teague and Oklahoma City's Dennis Schroder got into a shoving match after a Westbrook layup. After Schroder's initial shove, Teague followed up with two of his own. Teague was called for a double technical and ejected after a review. George led the Thunder with 27 points, hitting five three-pointers. Westbrook added 25 points and 16 assists while Steven Adams scored 20. Rookie Landry Shamet set career-highs with eight three-pointers and 29 points to carry the host Philadelphia 76ers past the Washington Wizards 132-115. Shamet, whose previous career high was 17 points, knocked down 8-of-14 shots from three-point range to set a Sixers rookie record. He missed his lone attempt from inside the arc. Joel Embiid had 20 points and 10 rebounds for his league-leading 35th double-double and ninth in a row. Jimmy Butler added 20 points while Ben Simmons contributed 17 points and nine assists. The Sixers played without guard JJ Redick, who was out due to lower back tightness. However, they received a boost with the return of Butler after a two-game absence caused by an upper respiratory infection. Bradley Beal led the Wizards with 28 points while Jeff Green added 15. Sam Dekker scored 14 points and Otto Porter Jr had 11. Kawhi Leonard made a key steal to set up the go-ahead field goal in the final minute and scored 31 points as the Toronto Raptors defeated the visiting Atlanta Hawks 104-101. Leonard has scored at least 20 points in a career-best 17 straight games. Kyle Lowry added 16 points for the Raptors while Pascal Siakam had 13 points and 10 rebounds, OG Anunoby had 14 points and Serge Ibaka 13. John Collins had 21 points and 14 rebounds for the Hawks and Jeremy Lin added 20 points. Trae Young had 19 points, Dewayne Dedmon 12 points and nine rebounds and DeAndre' Bembry 11 points. Leonard's one-foot jumper gave Toronto a 98-97 edge with 3:20 left in the fourth quarter. Dedmon made the next four points to put Atlanta ahead by three with 2:15 to go. Anunoby's lay-up pulled Toronto within one, then Ibaka's dunk after Leonard's steal gave Toronto a one-point lead with 17 seconds remaining before Anunoby's jumper sealed the win. Kelly Oubre Jr gave Phoenix the lead with a pair of free throws with 43.5 seconds remaining and added a dunk 32 seconds later, helping the Suns stun the visiting Sacramento Kings 115-111 after they trailed by 19 points at half-time. Ben McLemore matched his season-high point total in the second quarter alone, contributing 11 points to a 40-18 explosion that propelled the Kings to a 72-53 half-time advantage. But the Suns drew even by third quarter's end, and finished the game on an 11-2 run after falling behind again by five with just 2:25 to play. Oubre's free throws put the Suns on top after Willie Cauley-Stein scored on an alley-oop that gave the Kings one last lead at 111-110 with 1:03 to go. After a Kings turnover, Oubre made it a three-point game when he followed in a missed shot with a dunk with 11.1 seconds left. Deandre Ayton completed the scoring with one free throw with 7.2 seconds left, allowing the Suns to snap a six-game losing streak. Oubre led all scorers with 26 points, and Ayton finished with 17 points and a game-high 12 rebounds for the Suns. De'Aaron Fox paced Sacramento with 24 points, while Buddy Hield had 16, Cauley-Stein 15 plus to go with a team-high seven rebounds, and Justin Jackson 12. Thaddeus Young matched his season best of 26 points and Bojan Bogdanovic added 23 as the Indiana Pacers held on for a 123-115 victory over the host Cleveland Cavaliers. Jordan Clarkson scored 26 points and Alec Burks added 19 as the Cavaliers dropped their 10th consecutive game. Tristan Thompson had 15 points and 13 rebounds, Cedi Osman also scored 15 and Collin Sexton had 14. Cavaliers guard Rodney Hood (Achilles) missed his second straight game. Pacers center Myles Turner (shoulder) also missed his second consecutive contest. The Cavaliers used a 9-0 run to trail just 110-105 after Thompson's inside hoop with 2:17 left. But Young converted a three-point play 15 seconds later and added another hoop with 40.2 seconds remaining to help the Pacers thwart Cleveland's comeback attempt. Lou Williams scored 27 points and Montrezl Harrell added 23 as the bench led the way once again for the Los Angeles Clippers in a 128-109 victory over the visiting Charlotte Hornets. The starters did their part, too, as Tobias Harris had 23 points and Danilo Gallinari added 20 as the Clippers won three consecutive games for the first time since a four-game winning streak in November. Williams and Harrell entered ranked first and fourth respectively in bench points in the NBA and are the only set of team-mates who average at least 15 points off the bench. It was the sixth time this season Williams and Harrell each scored 20 or more in a game. Jeremy Lamb scored 16 points, while Kemba Walker was held to 13, 12 points under his average, as the Hornets lost for the third time in their last four games and the sixth time in their past nine games. Williams and Walker entered tied for the league-lead in fourth-quarter points this season with 266. Williams finished with 14 points in the final quarter, while Walker was held scoreless as the Clippers turned a nine-point lead into a 19-point victory over the final 12 minutes.